What is the non-surgical job? how long does it least? The non-surgical nose job (also known as liquid nose jobs or liquid rhinoplasty) is an injection procedure that Dr. William Hall can perform to change the overall shape and appearance of the nose. The results of a non-surgical nose job may be subtle or utterly transformative depending on what the patient desires. Some of Dr. Hall’s patients see outcomes that rival those that are possible with a surgical rhinoplasty. 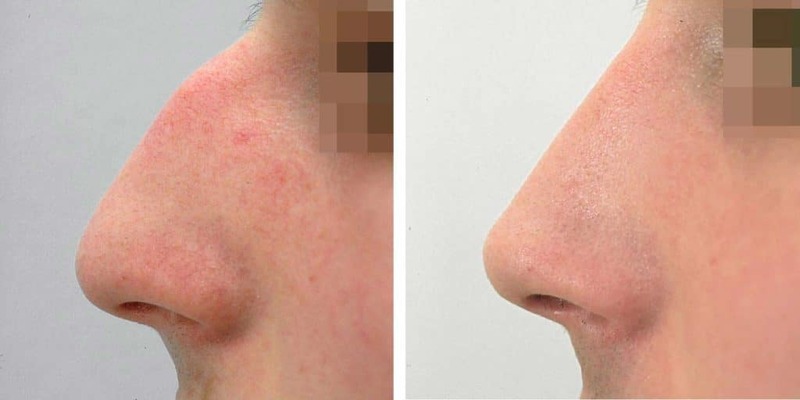 It doesn’t matter whether patients want a smaller, smoother, or straighter nose, a non-surgical nose job that can replace the need for a surgical rhinoplasty procedure. Liquid rhinoplasties can be performed in only about 15 minutes. As a result, this procedure has become known by Dr. Hall’s patients as the “lunchtime nose job”. A liquid rhinoplasty is done using off-label injections of hyaluronic acid (HA) filler to change the overall shape and character of the nose. 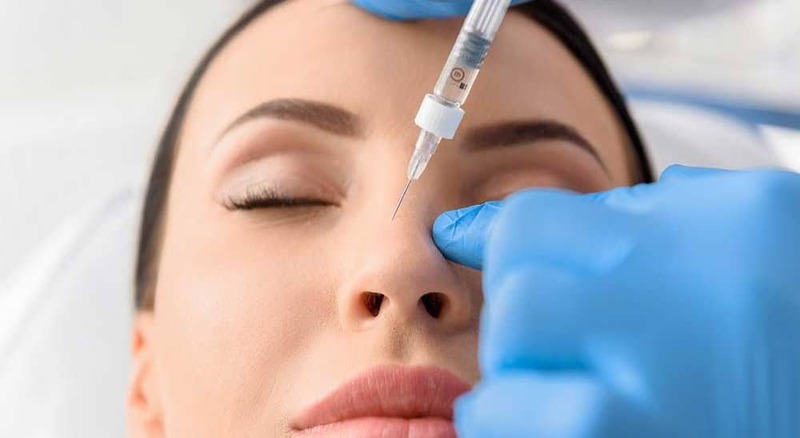 Though liquid nose jobs appear simple and the injection-based approach makes it seem like the kind of procedure that patients could take lightly, only a medical doctor should perform a liquid nose job to avoid complications. Many of Dr. Hall’s patients are amazed by what this procedure can accomplish in such a short period of time. The popularity of this procedure is understandably on the rise. The liquid nose job injections last anywhere from three months to two years, depending on the type of injection. Some liquid fillers dissolve slowly, while others are metabolized by the body more quickly. Dr. Hall recommends that patients opt for a more temporary filler at first and then after it dissolves, they can return for a more permanent filler option. When a permanent filler is injected, it can take up to 3 different appointments to complete the non-surgical nose job safely. Using a permanent filler, the liquid nose job can last for years. An ideal candidate for a liquid nose job is someone who has a bridge bump, a crooked nose, or a droopy tip. Dr. Hall can also correct curves in the nose as well as lumps and bumps and even use the dermal fillers to make the nose look smaller. There are of course some cases that may require traditional surgical rhinoplasty. Very large bumps or a very large nose may not be correctable using only dermal fillers. Also, broken noses cannot be treated using liquid rhinoplasty techniques. However, in some cases where there is scar tissue that has caused a widening of the nose, an injection of steroids can cause a subtle shrinking of the scar tissue. Relax – It is REVERSIBLE! Dr. Hall’s non-surgical rhinoplasty is reversible in the majority of cases! What this means is that, if you receive hyaluronic injections into your nose and the final results are not exactly what you expected, the changes can be reversed. Dissatisfied patients receive a different set of non-invasive injections within 24 hours of their initial procedure which can immediately dissolve the hyaluronic acid filler. The non-surgical rhinoplasty can be performed in as little as 15 minutes. As a result, many patients refer to it as the “lunchtime nose job”. After their appointment with Dr. Hall, patients can go right back to work. There’s no downtime, and no recovery period required following this procedure. The results are visible immediately. Most patients barely feel the injections. Dr. Hall uses topical numbing agents and sometimes ice that make the procedure nearly painless. Any mild bruising or swelling caused by the initial injections can be diminished or corrected completely with lasers. MAKE YOUR NON-SURGICAL RHINOPLASTY CONSULTATION TODAY at 480-800-4501.